Ousted prime minister Nawaz Sharif, his daughter Maryam Nawaz and son-in-law Mohammad Safdar, were released from Adiala jail on Wednesday after the Islamabad High Court suspended their respective prison sentences in the Avenfield corruption reference earlier in the day. 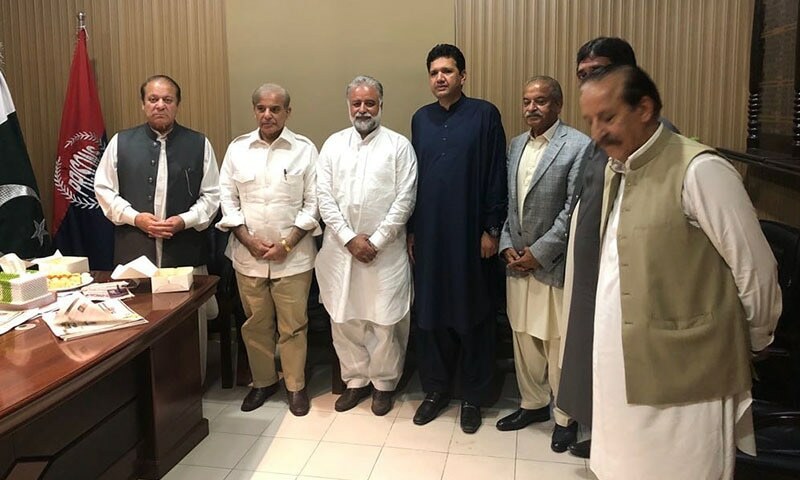 PML-N President Shahbaz Sharif along with senior party leaders reached Adiala jail in the evening to receive Nawaz after the IHC issued their release orders. A large number of PML-N supporters also gathered outside the prison to receive their supreme leader. Moreover, the workers showered rose petals on the convoy of Nawaz Sharif as it left the prison premises. The Sharifs were taken to Nur Khan Airbase, Chaklala, from where they will be flown to Lahore in a private aircraft. 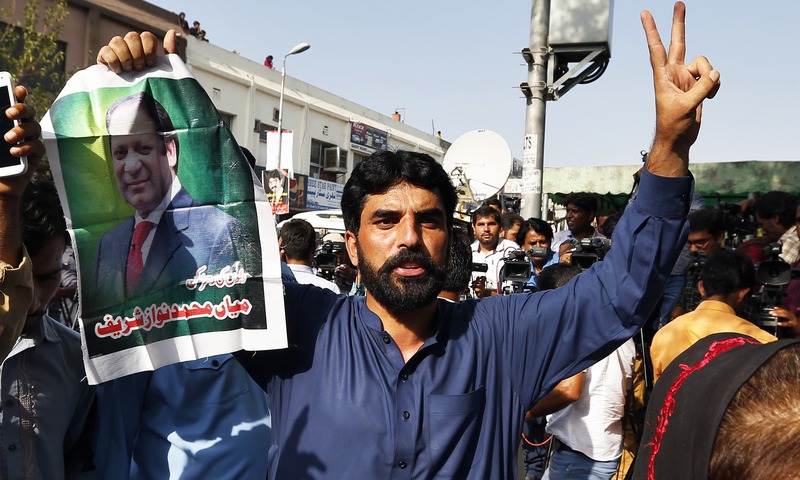 The convoy moved at a slow pace as the route was crowded with supporters and workers of PML-N, who took to the streets to celebrate the release of their leader. Earlier in the day, an IHC division bench comprising Justice Athar Minallah and Justice Miangul Hassan Aurangzeb heard the appeals by the Sharifs and Capt Safdar against the verdict announced by the accountability court on July 6. Nawaz Sharif, Shahbaz Sharif, Raheel Munir, Mehtab Khan and Murtaza Javed Abbasi in the Jail Superintendent’s room. The judges accepted the convicts’ petitions against the Avenfield verdict, ruling that the sentences would remain suspended until the final judgement on their appeals. “For the reasons to be recorded later on, the petition of Nawaz Sharif, Maryam Nawaz and Mohammad Safdar are allowed,” said Justice Minallah. The court granted bail to Nawaz, Maryam and Capt Safdar and ordered them to pay Rs0.5 million as surety bonds. PML-N workers present in the courtroom started cheering as the IHC’s verdict was announced. Dozens of jubilant supporters chanted “Prime Minister Nawaz Sharif!” outside the court. Javed Hashmi, a former PML-N member who quit the party for Pakistan Tehreek-i-Insaf, also reached Adiala jail after Nawaz’s release orders but was reportedly not allowed to enter. The development is the latest twist in a series of court cases involving the former prime minister, beginning with his ouster from office last year in the Panama Papers verdict to facing multiple corruption references in the accountability court. The accountability court on July 6 had announced the verdict in the Avenfield properties corruption reference filed by the National Accountability Bureau, handing the ousted prime minister Nawaz Sharif 10 years as jail time for owning assets beyond known income and 1 year for not cooperating with NAB. His daughter was given 7 years for abetment after she was found “instrumental in concealment of the properties of her father” and 1 year for non-cooperation with the bureau. According to the verdict, she “aided, assisted, abetted, attempted and acted in conspiracy with her father”. “The trust deeds produced by the accused Maryam Nawaz were also found bogus,” the judgement had noted. Nawaz’s son-in-law was given 1 year jail time — for not cooperating with NAB, and aiding and abeting Nawaz and Maryam. The NAB’s special prosecutor Mohammad Akram Qureshi concluded his final arguments today, following which the high court reserved the verdict in the case. Qureshi argued today that after the fixation of appeals against the conviction of the Sharif family in the Avenfield reference, the IHC could not have entertained petitions seeking suspension of sentence. He further said that since Maryam had prepared a forged declaration of trust in order to rescue her father, “she was equally responsible as she connived to dodge the legal course”. Qureshi further argued that Maryam was living with her father as a dependent and so “the properties in her name presumably belonged to her father”. Justice Athar Minallah remarked that “the NAB, after conducting thorough investigation, couldn’t bring any evidence of Nawaz Sharif’s ownership of the Avenfield apartments, but you want us to admit his ownership on mere presumption”. Qureshi responded that the “law of evidence empowers the court to presume facts in certain situations”. The prosecutor was reminded that there is room for giving the benefit of the doubt to the accused, and that the precedents of the apex court bound the bureau to follow certain procedures in order to shift the burden of proof on the accused persons. At this, Qureshi said that “since the properties belong to a foreign jurisdiction, therefore, it is a distinguished case and these were not applicable to this case”. Meanwhile, Khawaja Haris — the lead defence counsel — said that since the NAB law relates to foreign properties, the stance taken by NAB is without any legal force.